ITBP Constable Driver (Male) Call Letter 2019: Recently Indo-Tibetan Border Police Force had released the recruitment notification for the posts of Constable Driver. Many candidates applied for the ITBP Constable Driver Recruitment 2018 through the online mode. The process for the submitting of online application form started from 14 Feb 2018. All the Candidates, who have filled the online application form for the ITBP Constable Driver Male 2018, can check their exam date and admit card (प्रवेश पत्र डाउनलोड) details here. ITBP has Released Admit Card & Exam Date for Physical Efficiency Test (PET) and Physical Standard Test (PST) for the 134 posts of Constable Driver. Candidates who have successfully filled their online application form, and now waiting for exam date and admit card, may check the details through the link is given below. Dear applicant, as we all know, admit card is important to sit in the examination, without it no one can enter in the examination hall. Therefore, we have advised the candidates to keep ready a printout of admit card with other important documents. 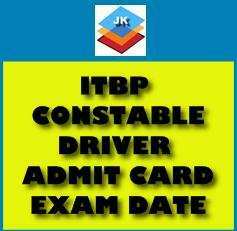 In this article, we have tried to provide all the information regarding the ITBP Constable Driver Male Admit Card 2019. Candidates are advised to check this page regularly to get updates on ITBP Constable Exam 2019.